42 x 45 x 27 in. 53 x 30 x 8 in. 24 x 36 1/4 x 9 in. 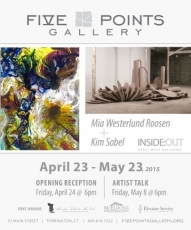 Westerlund Roosen has been exhibiting her sculpture since 1971. She has had several one-person shows in New York, most notably her first shows at the Willard Gallery in 1974 and another in 1975 and four one person shows at the Leo Castelli Gallery, in 1977, 1979, 1982 and 1986. Born in New York with Cuban heritage, Westerlund Roosen considered two careers, one as a dancer the other as an artist. She cites her interest in dance to be the reason her sculpture often refers to the body, its sexuality, its flow and its movement.